I have a crush on November. This time of year holds so many of my favorite things: sweater weather and pumpkins, hot chocolate and falling leaves. I love the crisp air and dark, cozy evenings. But my absolute favorite thing about this time of year is the focus on gratitude. While society seems to skip straight from Halloween to Christmas, I am a Thanksgiving girl. And it's not just about the food (although, that is certainly a part of my love). I try to spend the whole month of November immersed in gratitude for my blessings and intentionally focusing on thankfulness with my children. We have a dinner table tradition of writing things we're thankful for onto cardstock leaves. In the past I've made a big deal about announcing the arrival of the gratitude bucket. I've planned elaborate systems and methods for displaying the leaves. I've made a point to make each person share something they are thankful for each day of November. Then we read through the list of things we're grateful for on Thanksgiving morning before we head out to join extended family for feasting. 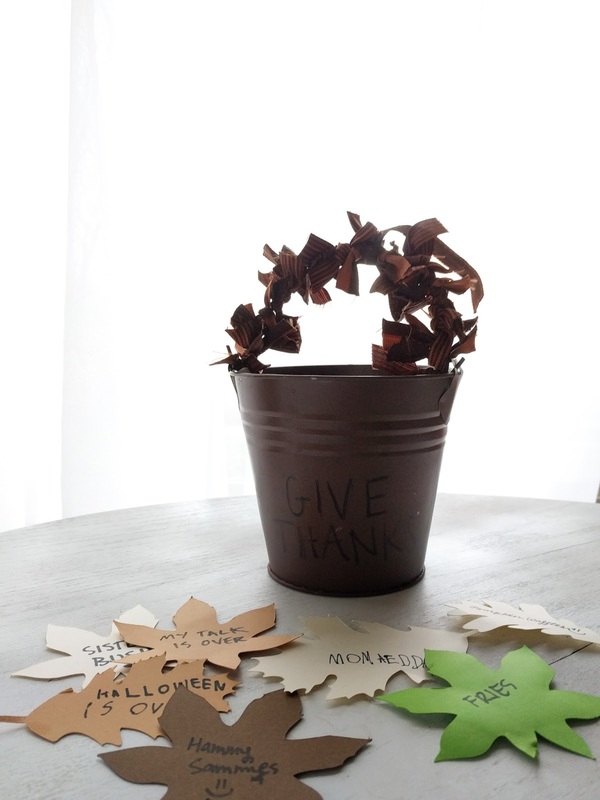 This year I pulled out our Give Thanks bucket and set it on the kitchen table. It was full of leaves cut on my silhouette machine and a few sharpie markers. As I prepared dinner that evening, I was still trying to come up with a way to display the leaves. Should we hang them on the windows? Or make a tree out of paper to hang on the wall? Should we hang them with clothespins on a garland above the fireplace? What could we do that our 2 year old tornado won't destroy? Our lives our full of chaos right now (thanks to our new arrival and a very busy toddler) so I didn't come up with anything. I didn't say anything about the gratitude bucket at dinner, thinking that I'd come up with something later. But after we were finished eating my husband pulled out a leaf and wrote down something he was grateful for. He placed the leaf back in the bucket and my older children quickly followed suit: each writing down a blessing on a leaf and placing it back in the bucket. I watched in amazement as I realized that this tradition is not just meaningful to me. My family has been impacted enough by the practice of gratitude that they spontaneously jumped into sharing their blessings without any prompting or prodding on my part. I was humbled as I came to the realization that I don't need to force or cajole them, like I was halfway planning to. They enjoy giving thanks and focusing on the blessings our loving Heavenly Father has given us. We don't need an elaborate way to display these blessings, we just need to focus our hearts on the many ways, large and small, that we have been blessed. This year our gratitude leaves are simple. And simple is oh, so good. We have a bucket on the table full of everyday blessings. I can hardly wait to look through them all on Thanksgiving morning. To help you celebrate your many blessings this season, I have a free printable coloring page for you. I am going to use the page to record my blessings. 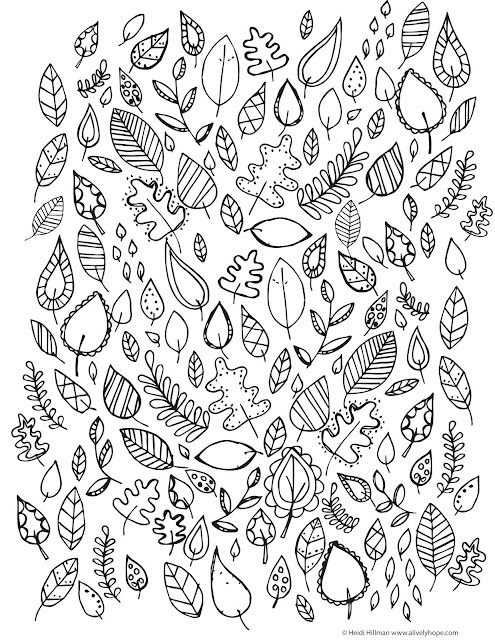 I'll stick it in my journal and write down a blessing or two each day on the leaves, coloring them in as I go.